GBR opened a new road course last year and not many people have been to it. I booked this day ahead of CSCS to get an edge on learning. What I've come to realize after doing SRTA's same layout over and over again is that it's not necessarily how good of a driver you are, but also how well you know the track. CSCS open lapping is fun, but typically there is a lot of traffic which makes it difficult for learning. The plan was to get to Grand Bend on Saturday and get the car setup (tires and brake pads) and go out and really learn the line. The weather was perfect and only a dozen or so cars showed up to the track. 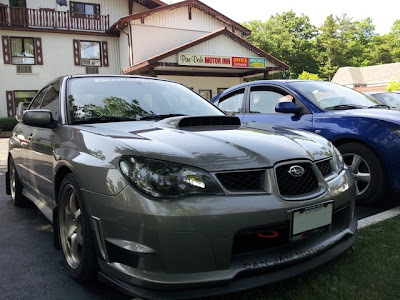 Since Grand Bend is quite the drive from where I live (3+ hours) I decided to book a stay at the Pine Dale Motor Inn so that I could be well rested for the time attack. GBR modified is a tiny circuit, with lap times hovering around the 1 minute mark. My goal was to crack the 1:00 mark just based off of what I've seen on the internet. On my very first session I did a 0:59.59 so maybe my goal was too easy. Although they did add curbs for 2012, which they didn't have in 2011. That could lead to faster lap times from cutting corners. I also learned that the main straight is actually an active landing strip for airplanes. I had to pull over during one of my sessions because a plane was landing! Imagine drag racing a Cessna down the main straight lol. I played around with a couple different lines and gearing throughout the day but this is the combination that yielded the fastest lap times. Theoretically this is how I want to drive the track but after watching my videos there is definitely lots of room for improvement. Pit entry feeds you into turn 2. Turns 1 & 2: These turns are linked so you can take a constant radius around them (double apex). 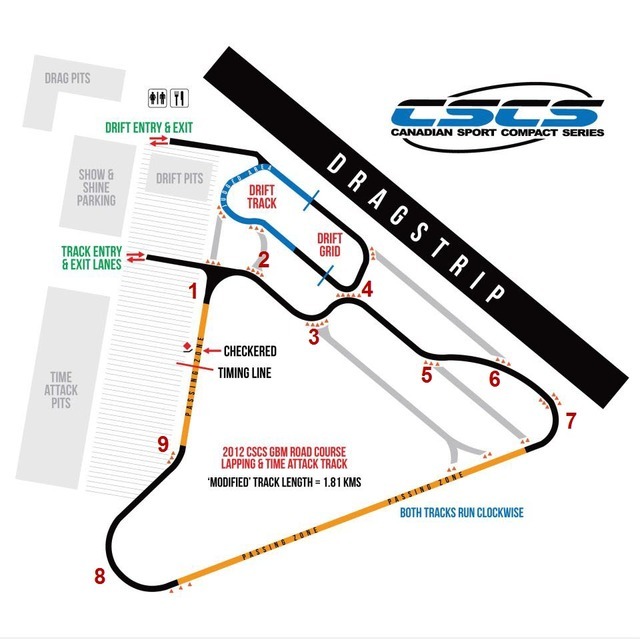 It looks like two turns in person, but on a map and in the car it's really one big turn. The track is overly wide here so running a tighter line is probably better. Turn 4: If T3 was setup correctly then you should be entering T4 from the about the middle of the track. Get on the throttle early. WOT and track left on exit, upshifting into 3rd gear as you swing over to the right side of the track to setup for T5. Turn 5: There is a small cutout on the left curb that you can place your left tire into. Because of this cutout, the curb is deceivingly level with the rest of the track and you can take this turn flat out. Turn 6: Not really a full turn, but because of the high speed through 5 you have to shuffle over left to get a wide entry into T6. This turn takes the most balls in my opionion and I think I could be going a lot faster here. Sitting in Kpower's car he takes this turn very well. I think he is lifting here whereas I am lightly taping the brake to get the car settled because I'm scared of running wide into the grass. Turn 7: Shoot for the middle if not wider past the first set of curbs so that you can get a really wide radius onto the straight. 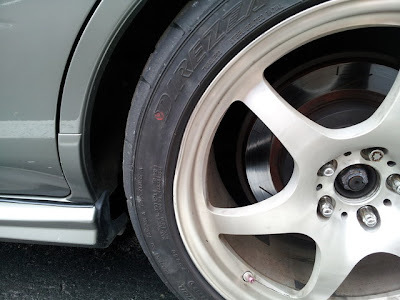 Get your right tire as close as possible to the tire markers on the inside of the straight. This is the most important turn of the track but not necessarily the most difficult to get right (I think that goes to T3/T6). I'm well into 4th gear on the straight. It's longer than the one at TMP. Turn 8: The carousel. I find I brake way later than most people here. I start braking at the 300 (3 pylon) marker but it's hard on the brakes and then trail braking. Brake earlier if you aren't comfortable with the back end getting squirmy. I keep a tight and tidy line around here. I see the faster guys running wide here though so I'm not sure if my line around here is better or worse. Turn 9: Most fun corner of the track because it can be taken flat out. There is a dip in the pavement close to the inside but it's not the end of the world to hit. Yes the car gets unsettled but it's leading onto a straight and I'd rather hit the bump every time and stay on the track than dodge the bump and end up off the track. I just barely skim the rev limiter on this small straight leading up to T1 so I don't bother upshifting.